Troy Rusk looked back on his baseball career years later with The Seattle Times. That career ended after five seasons. He made AA, but he didn't make the majors. Rusk accepted the career he had. "It was a fun ride. But when it was over with, I enjoyed going onto other things," Rusk told The Times. "I don't have to play baseball to be happy in life." Rusk drew his happiness then from working with kids at a baseball clinic business and his full time job as a architectural designer for a playground equipment company, The Times wrote. On the field, Rusk played his five seasons all in the Phillies organization. He hit 47 home runs and posted a career average of .252. Rusk's career began in 1990, taken by the Phillies in the 44th round of the draft out of the University of South Florida. At South Florida, Rusk hit 34 home runs over his career, fifth best at the school. He hit 14 of those in 1989, while knocking in 70 runs. He won conference player of the year in 1989, as well as all-region, according to the school's 2015 media guide. Rusk started with the Phillies at rookie Princeton. He hit .242 in 59 games. He walked and scored in a July game. The catcher also threw out a runner in another July game, ending a threat. 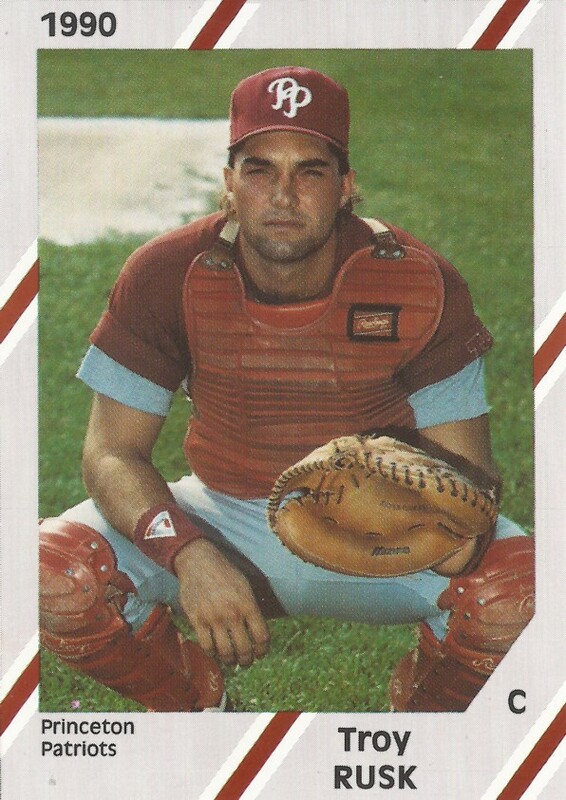 He moved to single-A Spartanburg for 1991, then split time between Spartanburg and high-A Clearwater for 1992. He hit .284 in 1991 and .252 in 1992. Rusk played a part in the only run scored in a double-no-hitter in an August 1992 game with Clearwater. Rusk drew a walk to move over a runner that later scored on a squeeze. Rusk first made AA Reading in 1993, also playing that year back at Clearwater. He singled in an August game. He then returned to Reading for 42 final games in 1994. He hit a home run in an April game, one of six he hit on the year. Overall, he hit .186 in those 42 games, ending his career.